To ensure that every concern of women is included in the conduct of development initiative, the Gender and Development office continues the conduct of the Seminar -Workshop on Gender Analysis. This aims to capacitate all faculty and employees on analyzing the gender responsiveness of CSU Programs, Projects and Activities (PPAs). 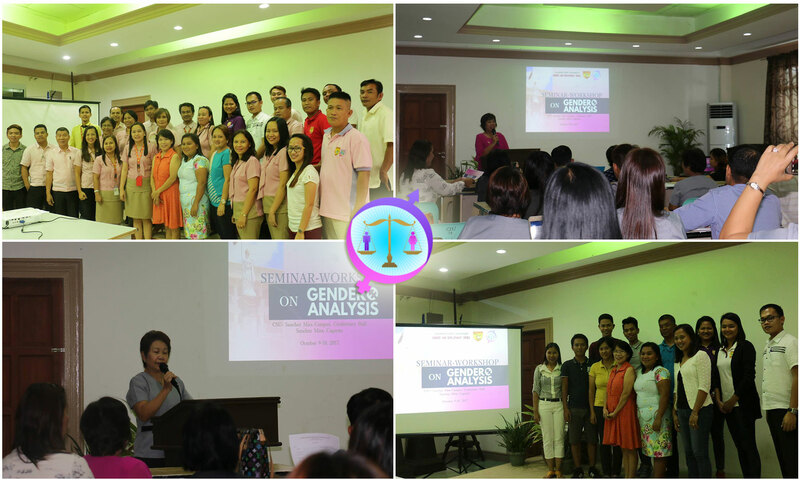 GAD conducted the second cluster of the Seminar-Workshop on Gender Analysis at CSU-Sanchez Mira the host campus along with Lasam and Piat campuses on Oct. 9-10, 2017. CSU GAD Advocates who underwent Training of Technical Advisers (TOTA) at the Philippine Commission on Women (PCW) were the resource persons and speakers during the Seminar-Workshop. The Resource persons are Dr. Jocelyn Tuscano, University GAD Focal person & PCW Certified Gender Resource Pool member, Dr. Chelito Malamug, GAD TWG member, CSU Andrews, Prof. Wendy Joy Garma, GAD Focal Person, CSU-Gonzaga, Ms. Norlizah T. Reyes, Member of GAD TWG of Carig, Dr. Verlino D. Baddu, GAD TWG Member and Dr. Remelyn C. Bautista, GAD Focal Person, Sanchez Mira campus. At the end of the activity, participants were able to identify the gender issues in their own respective campuses that need to be addressed. Also Gender Mainstreaming Evaluation Framework (GMEF) helped the participants evaluate the level of Gender responsiveness of their respective campuses. GMEF results of the 3 campuses are 49.72, 46.93 and 64.01 specifically levels 2 and 3. This indicates that they are gender responsive in their own respective campuses. On the other hand, the Harmonized Gender and Development Guidelines (HGDG) tool helped the participants assess the gender responsiveness of their PPAs be it on-going and completed. As a result of the seminar-workshop on Gender Analysis, Cagayan State University is positive that through this initiative, project implementers will be more gender responsive in conducting sensible research, extension, instruction and production endeavors of their designed PPAs.